You've just joined up with a local trail-riding group, and are getting set for your first weekend/overnight ride. You ride around your own place in jeans and boots - but what's proper to wear on a ride? Most clubs don't have set standards for dress on rides, unless they are sanctioned Endurance rides, but there are guidelines which everyone should at least note. Long pants, whether jeans, jods, or breeches, are a must. If you are riding Western, jeans are the usual choice. However, there are many different types of jeans. Straight legs are tighter fitting and can go inside a boot. 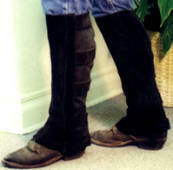 Drawbacks - the seam can rub your inner leg and ankle if tucked into high boots. 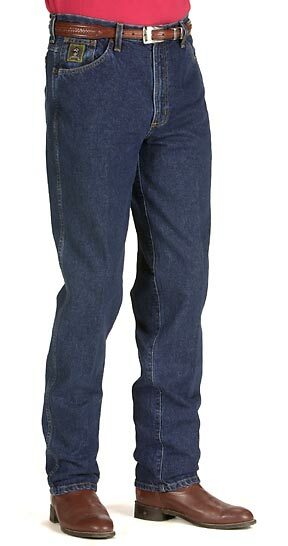 Boot cut jeans are designed to go over the top of a pair of cowboy boots - more on boots themselves later. Stretch jeans are comfy to some women, but the material is thinner and doesn't have as much "seat grab" as regular denim jeans. There are even "karate" jeans that have an special diamond-shaped inset in the crotch to allow for greater flexibility in the seat area. This could be a benefit for the smaller rider on a big mule! A good fit in pants, with enough leeway to stretch to mount and dismount, is preferable to pants that are too loose. 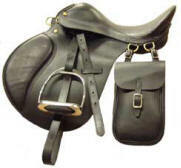 Loose and baggy will ride and bunch, and can rub or lie in wrinkles, causing discomfort in the saddle. English riders usually go ahead and wear breeches. The different types of finish in breeches include knee patches all the way up to full seat breeches. These leather reinforced areas help cut down on "slide" in the saddle. One hint - no matter what you decide to ride in, try on those favorite pants a couple of days before the ride. Don't just dig them out of the closet and pack them. You might get to your event and find out they don't quite meet at the zipper any more! 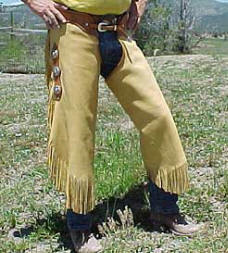 You may want to wear chaps over jeans if the weather is cool and the country looks brushy. There are also English exercise chaps, and half-chaps that fit just over the calf and can be used with short boots. Always plan on layering your clothes. You can never quite depend on the weather. Short sleeves or sleeveless riding shirts are great, but if the temperature drops suddenly at dark, you'll want to make sure your jacket is in your saddle bag. Wear sun screen! Also, if you go the bare-armed look, wear sun screen! A day in the full sun can result in some mighty tender red shoulders if not protected. Always use the highest sunblock you can. Another plus to sleeves is low branches -some cloth over your arms offers a little protection from scratches. Long-sleeved T-shirts are popular as casual clothes now, and can always be enhanced with a photo of your mule for more fun. Big advantage - they are comfortable in all but the hottest weather, can be wet down in hot weather for a cooling effect, and the sleeves can be pushed up or worn down as you like. Pocket tees in both men’s and women’s styles, in a huge variety of colors, are available in most department stores. Color co-ordinating with your mule or spouse is a snap! Riding Socks There are several types of special riding socks made, as well as those good old sport socks. Cushion foot and boot socks are a plus if you think you'll do some walking. If you are changing to a new type of sock, try them on with your riding footgear. Some insulated socks (for those fall rides) may take up too much space in your cowboy boots and pinch your toes - not a fun thing to find out in the middle of nowhere with a lame mules. FOOTWEAR: Whatever style you choose to ride, and whatever footgear you choose to go with it, anything on your foot should ha ve a low heel. Fashion boots with 2" plus heels are a definite out, but a low heel in on riding boots for a reason. If you have a fall, the heel on the shoe helps prevent your foot from going all the way through the stirrup and being hung up. You've always heard you should never wear tennies around horses or mules. Two go od reasons - no reinforced protection for the foot should you get stomped, and no heel for the stirrup-stop. There are new "riding tennies" (one brand name is Heels Down) that run about the same in cost (or maybe slightly higher) as some regular tennis shoes. Check your local tack store for availability - they are worth it. The style of western boots depends on your taste - but make sure that they are comfortable to walk in. Pinched toes and rubbed heels are no fun leading back your mule after HE throws a shoe (and you forgot your Easy Boot). For the same re ason, make sure your boots are already a bit worn and broken in before you ride. Storing your tall boots (english or western) on boot trees can help prevent them from breaking down at the ankles. This, in addition to a tall, narrow stack, can contribute to rubbing at the ankles. English riders may prefer the riding tennie, or their tall riding boots. 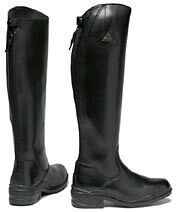 Short field or paddock type boots can also be combined with half-chaps for more leg protection. UNDERGARMENTS Can stand the bounce, but can't find the bra? If you are a big woman, you have a problem, and many of us sympathize. Those sports bras just don't always do it. Try for a bra with maximum support, preferably with some shaped around the cup area. Really big? Try a regular, comfortable bra with a sports exercise spandex halter top (similar to the sports bras in shape, but cut longer with less elastic at the bottom) on over it. Then a loose t-shirt to help keep cool. T-backs on the bras seem to help somewhat. Whatever your size, make sure the bra is comfortable, and will not rub you raw on shoulders and underline. Underwires are probably a no-no, as are scratchy lace and satins that won't absorb wetness. You'll sweat - excuse, me, perspire, no matter what. A bit of baby powder strategically placed when dressing can help. Guys and gals both - wear comfy drawers! Use cotton - it breathes! High cut legs will crawl higher the longer you sit - and you know what that means!!! The longer you can get the leg on drawers, the better. Biking shorts (in both male and female styles) are great as the legs come down onto your thigh. There are also special men’s and women’s padded riding underwear. Buy two pairs so you're not stuck with the crawly type on day two!!! GLOVES? Should you wear gloves or shouldn't you? Some people do, some don't. Do you work with your hands a lot? are they tough and worn? You might not want to. But do you work in a food industry where you can't have scrapes and cuts on your hands? Or have long fingernails and want your hands to stay looking nice? Wear gloves. Stretch lycra-type gloves for riding are okay if you can hold the reins without them sliding. combination stretch with leather is better. All leather are nice, but can get expensive, and sometimes the dye can sweat off onto your hands. String gloves with textured palms are wonderful for summer, cool and light. (If the weave is really open, consider a dab of sunscreen on the back or your hand, or you could end up with an interesting pattern on your hands! 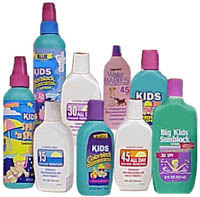 (Sunscreen should be used in winter, and on overcast days too. The UV rays are still there.) 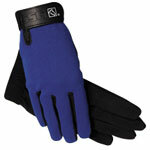 In winter, gloves should be a must - you need to be able to feel the reins. 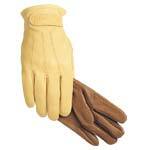 Stretch gloves with textured palms, wooly ones with textured palms, or try the silk glove liners under leather. Try on gloves to make sure you have plenty of depth in the fingers. HEADGEAR If seems that a lot of Western riders don't feel the need to wear a protective helmet. 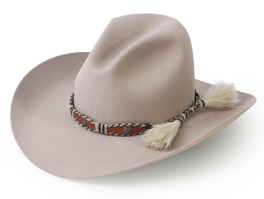 But there are riding helmets out there designed for western riders, with a shell shaped like a cowboy hat to go over it. No offense to anyone who rides without a helmet, but we sincerely hope it doesn't catch up to you some day. Some of the worst falls have been from gentle animals. A helmet won't protect you in every fall, but they can cut down on the numbers of injury statistics. 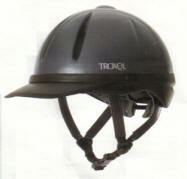 There are riding helmets that look like the bike rider helmets, in addition to the traditional black or brown velvet hunt cap. So you get hat hair - carry a spritzer bottle of water (not a bad idea anyway for hot days) and a comb. If everybody has the same hairstyle, it makes it easier! If you do use a helmet, make sure it fits with the hairstyle you will use (ponytails don't always fit and always fasten the chin safety harness. If you don’t use a helmet, wear some kind of hat (cowboy hat, baseball/gimme cap) to keep the sun off your head and avoid a burned scalp! It might be a good idea to call ahead to your riding event and see if they have rules on helmets, especially for youth riders. FINISHING TOUCHES: You love your jewelry and would never be caught dead without at least earrings and a necklace. Great - but make them small. Use earrings that have posts and snug backs, or the kind that have a bar that loops back up to the hook. You can also put a back on the end of most french-hook earrings to keep them in place. A 50-mile ride is nowhere to loose your favorite earrings. If you are wearing a necklace, don't wear long ones that might catch on the saddle while mounting or dismounting, or one that's going to rub your neck while riding. to sweat. Buy a special watch for riding if needed, and leave the jointed metal band ones at home. Makeup - go easy or go without - substitute some water-proof foundation and/or sunscreen on forehead, nose, and cheeks. 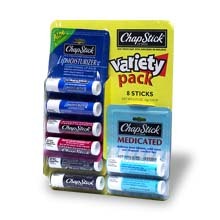 Lip balms rather than lipsticks are a plus - guys might tuck a Chapstick in their pocket too, and sunscreen can protect the fellow's nose as well. PERFORMANCE. Color coordinate your layers, but the ultimate goal of dressing for a ride is comfort in the long run. If it rubs, pinches, digs, rides, or is otherwise uncomfortable, don't wear it! Find an alternate piece of clothing that does better. 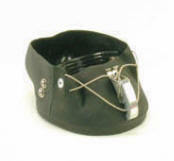 To help with wear and tear on the seat - your and your saddle's - you might consider a fleece seat saver. Try it out at home first - some are more slippery and a few people can't use them at all, as they loose their grip with their own seat on the saddle. Make sure you have saddle bags to carry the little extras you need - layers, dry socks if you think you might need them, lip balm, small towel, etc. Get yourself and your mule used to new clothes (this means his saddle too) before the ride. Don't try new gear out on a long ride - the results might be painful for both of you. Pack light if you are carrying equipment on your animal, and always remember to pack an extra set of clothes beyond the days you'll be riding. You never know when you will get caught in a sudden downpour on the way back to camp, and realize you forgot any extra clean clothes! Find a style of outfit you like, coordinate it to suit, and have fun on the trail!